Have a question for Polaris Tourist Pension? "Matthew, the host, was very friendly and was there waiting for us at the bus stop when we arrived." 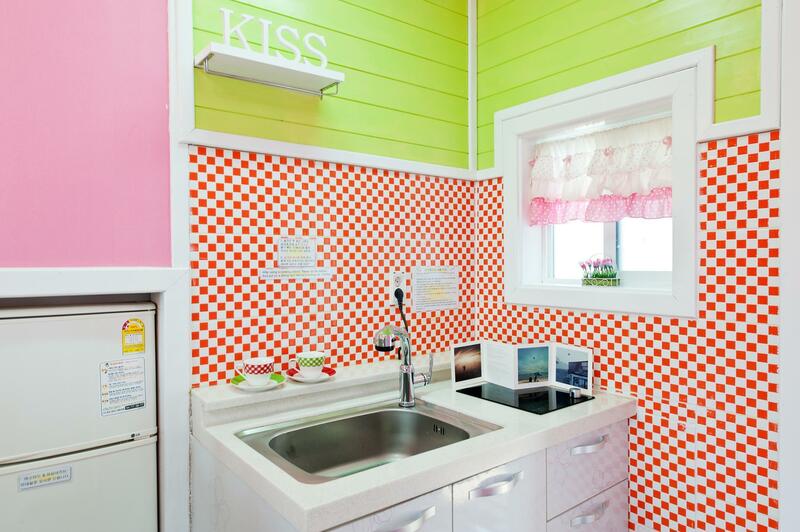 "As a group of 8, we loved the houses which are cute, quirky and very comfortable." "Thank you so much, Matthew, for the great hospitality you showed us." "The place is just amazing!" 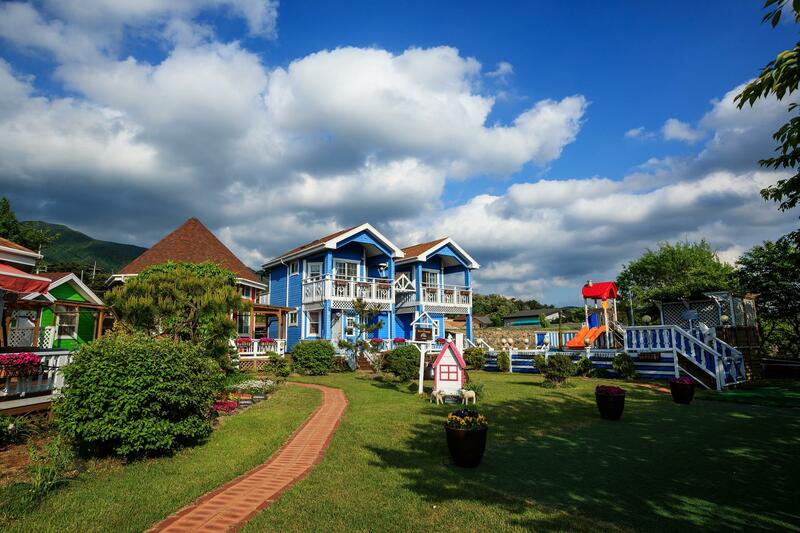 Located in Gyeongju, the charming family-run Polaris Tourist Pension is situated next to the beautiful Gyeongju National Park. The famous Bulguksa temple is located a little over one kilometer away. The Bomun Special Tourist Complex is only five minutes away by city bus from the pension. Gyeongju Museum and the Royal Tomb are 23 minutes away by bus, while Gyeongju Intercity Bus Terminal is a 30-minute bus ride away. Polaris Tourist Pension provides an outdoor barbecue area, free Wi-Fi, free laundry service, and complimentary parking. The spacious, air conditioned rooms come with a private balcony with views of the garden and mountains. A flat screen TV and small kitchen are included. Bathrooms come with shower facilities and a hairdryer. The property's owner can speak English fluently and can help guests with dining recommendations and travel plans around the Gyeongju area, and the nearest convenience store is only 200 meters away. For you convenience, a free two-way shuttle service from Bulguksa Station is available for all guests. "We stayed here for one night and was very impressed with the..."
Swimming pool is a seasonal facility, open only during the summer months (July - August). We stayed here for one night and was very impressed with the pension. Mr Matthew Noh, owner takes a personal interest in taking care of the customers. He helped us with places to visit in Gyeongju-si. The rooms are neat and clean but slightly small. My kids were super excited with the nicely painted houses. Matthew is a great host providing prompt response, clear guidance and extra tremendous services. 4 of us participated April 7 Cherry Marathon event. My friend forgot his Suunto watch in the toilet of event place. He was frustrated not because the value of the watch but all running records are with the watch. Next day, we packed and left Polaris and travelled to Daegu, Matthew messengered me that .....you forgot your two medals. Matthew promised that he will try to contact and find the watch, and if found, he will send to Taiwan the watch together with two medals. Unbelievably and fortunately, the watch was found and kept without any damage. Matthew carefully packed them and sent to us without delay. We really troubled him very much and we appreciate his great patience. Parcel received 2.5 days later. We can not say enough to express our gratitude....Many thanks to Matthew....We really wish to stay again with Polaris to enjoy your hospitality. Highly recommended!!! We had a great time at Polaris. As a group of 8, we loved the houses which are cute, quirky and very comfortable. Matthew, the owner, is just wonderful. He picked us up from and retuned us to the bus station, drove us to local restaurants and even acted as our guide for our day tour of Gyeongju. Although Polaris feels very private and away from the noise and traffic, many things are within walking distance including convenience stores, restaurants and the traditional craft village. Thank you so much, Matthew, for the great hospitality you showed us. We will definitely be back and will surely recommend Polaris to our families and friends when they come to Gyeongju! Matthew's pension is so scenic that I came back for a second stay! Getting there is simple - simply take bus #700 from the Singyeongju Station (~45minutes ride), the pension owner, Matthew, will pick you up from the bus stop near his home and drive you to a nicely decorated pension fully equipped with a kitchen, large-screened LCD TV, 2 coffee tables, a vanity table, and a luxurious bed and toilet. He is also an avid photographer that gives great tips on composition, so don't forget to get some good photography tips while you're there! Matthew, the host, was very friendly and was there waiting for us at the bus stop when we arrived. Prior to arrival he had emailed all the information that we needed to get there. The pension is located outside of the city (about an hour by bus from Singyeongju train station), but is walking distance to the bus stop so getting around is not a problem. Our room was spacious and clean, with a little veranda out front if you'd like to catch a breath outside. Sleeping at night was peaceful as we were out in the country, basically. Good place to stay, overall. The host has been extremely helpful and forthcoming with any request. The room is cosy and pleasant. The location is strategically located with decent connection by bus to the various sightseeing locations? Nestled in the midst of mountains, the Polaris Pension is a great place for travellers who wish to escape from the hustle and bustle of city life. Completely equipped with a kitchenette, dining table, balcony, amongst pther facilities, this place is a great place for one to rest and recharge! 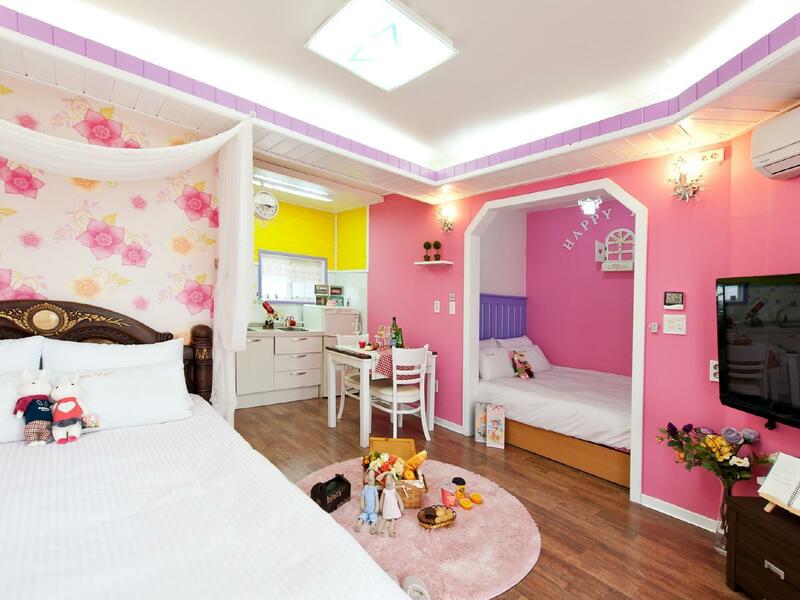 The place is located very close to attractions such as the bulgaksa temple, seokguram and the bomun resort. However, as the buses are highly infrequent (approx 20-30mins interval), travellers may wish to rent a car or book a tour package with the owner. Upon arrival, the kind host, Matthew will help plan your travel itinerary for you. He is also an avid photographer and very interested in meeting new friends from around the world! If ypu like nature, and a homey setting, Polaris is a great choice for the tranquil traveller. I will definitely be back here the next time I'm in Gyeongju area. There is nothing to dislike. Everything is pleasant, clean, and welcoming. The surrounding is green and peaceful. There is even a really cool coffee place nearby. Matthew, the owner, is really friendly and helpful. He helped us plan out our short but fruitful exploration of the Gyeongju attractions, including Mt Namsan. Once you figure it out, it is actually quite easy to travel to all the attraction sites by bus, which come regularly. One night is too short. I have a wonderful stay in Polaris Tourist Pension.It is a very comfortable hotel. Matthew (The tenant) is very nice and helpful. The room is very clean and tidy. Pension outside has a good scenary and we can see cherry blossom during our stay. In conclusion, I highly recommend all of you to stay here. It was really great stay at Polaris with my family. Staff was really kind and give useful information about all city history and food etc. I was really enjoy to stay there and I will recommend to my friend who will visit gyeongju. Hopefully I can visit pension again during summer and enjoy their nice pool with my kids. Bus stop was very near the premises, the manager was really friendly and the room was cosy. Matthew was really helpful and friendly. He even drove us to one of the attractions and helped me check the schedule for inter city buses. The room was clean and cosy too. Overall, it was a really great experience! I stayed in Polaris Pension with my family of 6. The place is just as shown in the photos. Very close to Bulgaksa Temple. Matthew the owner do cater for pickup services and day tour services which is excellent for my family with elderly. He even helped us to call for delivery order which we wanted to experience. Overall I am very satisfied with my stay there and would recommend my friends as well. Polaris is definitely one of my favourite accomodation away from home. 1.The host Matthew is very friendly in welcoming guests, he provide pick up service for guests in train station, and send welcoming email befor eyour arrival to prepare your visit Also, during the stay, he is so helpful to provide all travel information, very well organised.Before leaving the pension, he helped us to take nice photos in his lovely pension 2.Locations is so convenient, close from the train station Bulguksa, and only 3 mins walk to bus station which take you to all tourists sites in Gyeongju 3.The pension design is so nice, feel so relaxing and all the facilities are so clean.Amenities are all provided and tidy. I came here to show my parents around the sights. We didn't have a car, so the owner of the hotel, Matthew was so kind to help us. He drove us to Bulguksa and explained in detail how to get home via bus and taxi. He also gave us a brochure and was an excellent tour guide. Then, when we had to leave, he drove us to the train station. We came by slow train, but the best station to come to this hostel from is the Buguksa Station, not Gyeongju Station. The room was also excellent. I stayed there with a group and the beds were comfortable and the bathroom had a nice shower. I would definitely stay here again! The host spoke fluent English and provided lots of useful information for us. The BBQ dinner is highly recommended and the host offered us more than we could finish. The scene is really beautiful there. Highly recommended! Fantastic place, wish we can stay longer. 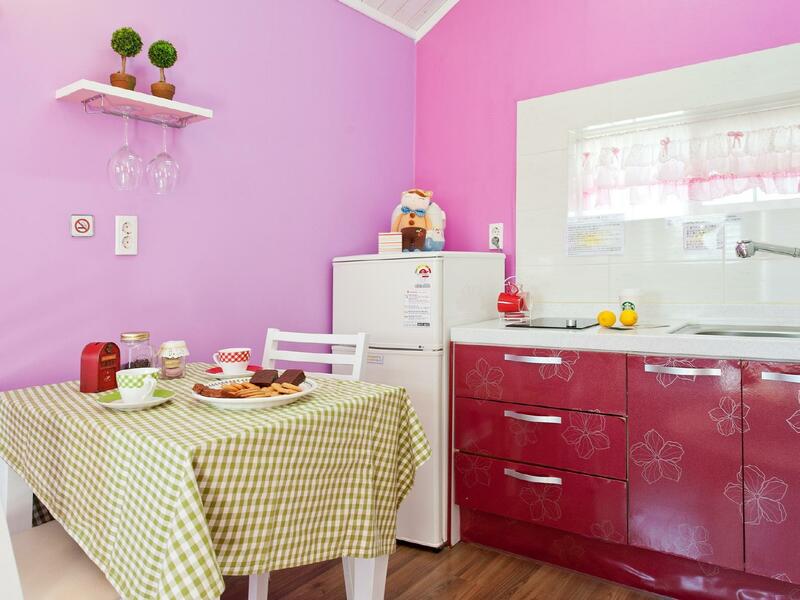 Well decorated and fully equipped apartments. Very cosy place. Friendly and helpful owner shared with us the places to go to in Gyeongju-si. Definitely will stay again if I go Gyeongju again. This was the second time I took a group to the Pension. Matthew was and is the best host! One of my participants was ill and he took us to the pharmacy. Matthew also made reservations for us and when we had to cancel one reservation he was so nice to do so. This is the best place to stay in Gyeongju (I've stayed a few other places), it's a beautiful getaway from Seoul to enjoy the culture of Gyeongju and friendly host. I will never stay anywhere else--the Polaris Pension will always be home away from home.